What would you call a place where you could breakfast on grilled bread with coconut jam, lunch on otak-otak (Malaysian fish mousse grilled in banana leaves), dine on Indian tandoori, and midnight snack on Indonesian satés? Where nonya (grandmother) style stingray seasoned with garlic, chile, and lemongrass and grilled in banana leaves shares your plate with minced and grilled Chinese sweet pork jerky? The maps call it Singapore. The nearly five million people who make up this island nation at the tip of the Malaysian peninsula call it home. I call it a grilling nirvana. Established as a British colony by Sir Stamford Raffles in 1819, Singapore lies at Asia's strategic crossroads--Malaysia and Thailand to the north, Indonesia to the south, India far to the west, and China and Japan to the northeast. Limited in size and natural resources, Singapore has always lived by trade. For two millennia, the island nation has been port of call for Chinese sampans, Arabian dhows, Indonesian pinisi, English merchant ships, and American clippers. The constant flow of peoples, comestibles, and food cultures have made Singaporean barbecue some of the most diverse in the world. Singapore's government also helped. In Singapore, as throughout Southeast Asia, the best grilling (not to mention noodle dishes, soups, stir-fries, and the like) turns up not at restaurants, but at pushcarts and sidewalk cookshacks. In the 1970s the Singaporean government took the extraordinary step of registering and certifying all street vendors, relocating them to municipal hawker centers equipped with electricity, running water, and sanitation codes more stringent than those in the United States. Today, more than 10,000 street cooks--among them Singapore's top grill masters--ply their trade at 115 government-certified hawker centers, like the popular Newton Circus Hawker Centre, East Coast Lagoon Food Village, or Gluttons Bay. At almost any hour of the day or night, for a surprisingly affordable price, this is where the real Singapore eats. And so should you. 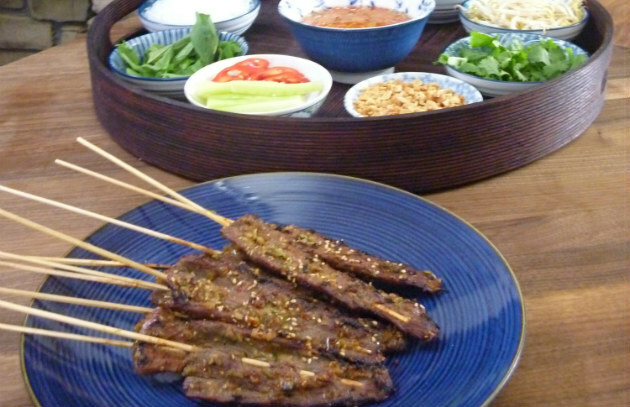 For recipes from Singapore, visit BarbecueBible.com.